(Herald Press, 1991), 159 pp. 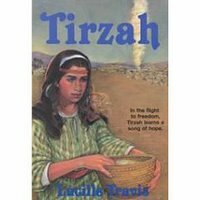 This is the story of a young Israelite girl, Tirzah, as she and her family follow Moses out of Egypt to Sinai and toward the Promised Land. We read this book about a year and a half ago and my boys (about 8 and 6 years old) enjoyed it. It was a bit slow for them in places, and I was a bit uncertain about some historical particulars, but overall it was a good book. It provides an ‘inside’ look on what it might have been like to be a part of the Exodus. Mrs. Travis does a good job in showing the presence of those who led the complaining against Moses. It is helpful in understanding the story to be reminded that these people would have been neighbors and family members of the rest. The story represents well the stresses and strains on families as they seek to survive, to understand whom to believe and follow (Moses or others), and to be faithful to God. We can tend to simply assume that it would have been easy to have faith in this situation, but the story shows the struggle to believe. The story ends a bit suddenly, just after the Israelites (at least the majority) refused to enter the Promised Land at Beersheba. The book closes with Tirzah’s parents, who had been for obeying the Lord, sitting around the fire with their children contemplating the judgment just handed down from God. After sitting quietly the father led them in prayer with tears. Then he takes his wife’s hand and says to his children, “My children, though we shall never see the good land Yahweh has promised, you will … Your mother and I will prepare you for the day that will come when you shall enter the land. You will take our places, be our eyes, our ears. Your joy will be for us too. … We shall teach you all that we can, my dear ones, for as long as Yahweh wills.” When his wife begins to weep, he says, “Remember, my dear, we are forgiven. Yahweh’s love is great and his decree is just.” I had never considered a family sitting together contemplating the fact that the parents would die in the desert but the children would make it to the Promised Land. The picture of a faithful father leading his family through such a time with faith in the goodness of God was both convicting and encouraging. This powerful ending alone makes it a worthwhile read. Thanks for the book review! Yes, I have thought of this book from time to time when your daughter's name has come up but I have failed to mention it. AS I was posting the next review, I thought of the fact that it would also connect with you as well since it is set in Kenya.